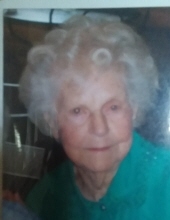 Long Creek - Charlotte Moore Phillips, 97, widow of the late Cecil F. Phillips of 105 Charlotte Lane, passed away, April 9, 2019, at her residence surrounded by her loving family. A native of Oconee County, she was the daughter of the late John E. Moore and Evie Wilbanks Moore. She was retired from Kendall Manufacturing and was a member of Long Creek Baptist Church. Survivors include her daughters; Brenda J. Harris (the late Harold), Patsy Phillips and Becky C. Stanton (Jim); grandson, Cale Harris; granddaughter, Regan Stanton; and two great-grandchildren, Keegan Harris and Harper Harris. In addition to her husband and parents, Mrs. Phillips is preceded in death by a son, George Phillips; brothers, G.A., Wade, Jule, Edd, Verner and Patrick Moore; and sisters, Polly Matheson and Mae Wise. A graveside service will be held 11 am, Saturday, April 13, 2019 at Long Creek Memorial Gardens. The family will receive friends 6-8 pm, Friday, April 12, 2019 at the Sandifer Funeral Home. To send flowers or a remembrance gift to the family of Charlotte Moore Phillips, please visit our Tribute Store. "Email Address" would like to share the life celebration of Charlotte Moore Phillips. Click on the "link" to go to share a favorite memory or leave a condolence message for the family.